I woke up a few minutes before Henrik a couple weeks ago and I turned on OPB. I heard an ad for Clear/Clearwire with the slogan, “Covering Portland”. And that is exactly what they are doing. 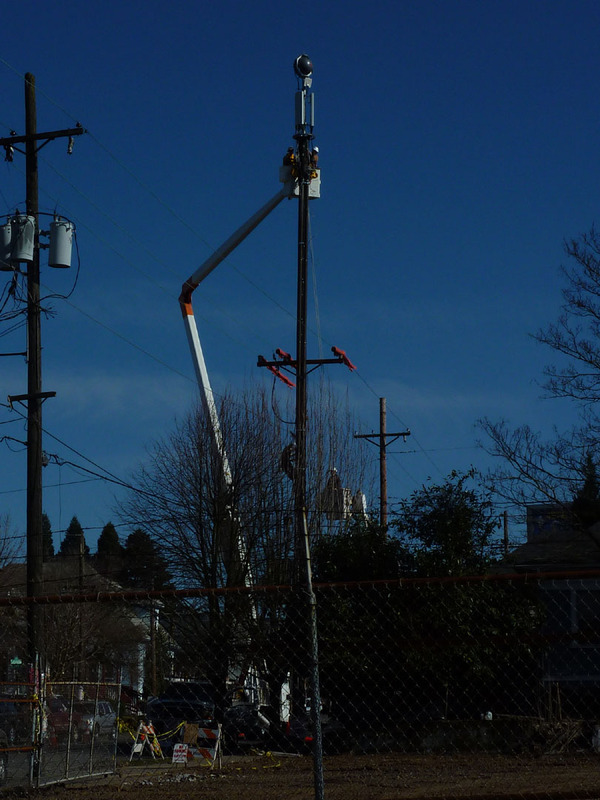 They are covering Portland with their towers and their wireless signals. I stumbled upon the installation of the above tower one day. A similar tower has been proposed, and is currently being fought by neighbors and neighborhood groups, at the corner of SE 39th Ave./SE Cesar Chavez Blvd. & SE Ogden St., which is only about 4 blocks from my house and is on the dividing line between the very residential Woodstock/Eastmoreland Heights and Eastmoreland neighborhoods. Clear’s intends to install multiple additional towers in these neighborhoods. There was an initial meeting a few weeks ago to inform the neighborhood of the installation of the tower, but the neighbors around the tower site were not properly informed in advance. A follow up meeting has been scheduled for November 2nd at 6:30pm at Duniway School Auditorium at 7700 SE Reed College Place. If you live in the neighborhood and are concerned about the ubiquity of wireless technologies, please come to the meeting. If you live in Portland and are concerned about aggressive wireless companies installing towers in your residential neighborhood next, please attend the meeting and let your presence show that neighbors will come together and fight to protect our comminutes. I just picked up a copy of Dr. Devra Davis’ new book Disconnect at the library yesterday and I can’t wait to crack it open. Her website is a great resource for information about the unproven safety of wireless technologies. RespectPDX is an excellent local resource about what is happening in the Portland area. Also, I have shared my thoughts previously about the unproven safety of wireless products and how we need to invoke the Precautionary Principle until guidelines have been established for safe use of wireless products. Many people are working together to fight the installation of this new Clearwire tower. The Woodstock Neighborhood Association came out against the tower at their last meeting. I have included the letter that I wrote in protest of the installation of the new tower. The contact information for a couple of the Clearwire managers is included below my letter. Let your voice of opposition be heard. In the past two months I have received two refund checks from companies whose products were deemed unsafe. One was for a cloth book that we bought at an independent bookseller a few years ago for our one year old son. We just found out earlier this year that the book contained high levels of lead. As a developmentally appropriately one year old, my son chewed on this book. Luckily, he did not chew off the round circle that contained the highest levels of lead. I returned the book when I learned of the recall and received a refund check. Last winter my son was up in the middle of the night shrieking hysterically with an ear infection. My husband drove to the store and bought Tylenol and Motrin. This summer we learned that both the Tylenol and Motrin had been recalled due to contamination. Our son was not adversely affected to our knowledge. Again, we received a refund check for the recalled items. Two vastly different types of products were recalled and refunds were issued. I don’t know if any children were injured by the recalled products, but the companies were willing to offer financial compensation to prevent possible future damage to children’s bodies. In both recalls there were clear samples groups. Either you bought and used the recalled items or you didn’t. With wireless technologies, everyone is now in the sample group. We come in contact with wireless products every day. As individuals, as communities and as a nation, we have been preemptively stifled in our efforts to protest the installation of wireless equipment based on health concerns. How large of a refund will be offered to my son whose lifetime burden of wireless exposure cannot even be imagined at this point. Even worse, I am concerned about the day when we are told that the adverse health effects of exposure to wireless products cannot even be studied because there will be no population that is free from contamination to use for comparison. My husband and I picked DSL over wireless when we moved into our current house. We have a land line. We have a joint cell phone plan and we share the 250 included minutes. We have never sent a text message. We turn our phones off in the house. I do appreciate the security I feel that I can use my cell phone when it is necessary. I consume wireless technology in the most minimal way possible and I am asking you to refrain from citing a new tower at SE 39th Ave./Cesar Chavez Blvd. & SE Ogden Street, which is in my neighborhood. I was concerned after we moved into our current house from outside the Portland area about how many wireless towers and antennas there already were on Woodstock Blvd. We bought our house deep in a residential neighborhood so that we would be better insulated from towers and antennas, which tend to follow commercial zoning patterns. Though speckled with non-residential properties, SE 39thAve./Cesar E. Chavez Blvd. and SE Ogden St. is not a commercial zone and it is not even a thoroughfare. The street ends eleven blocks south of the proposed site. Citing a tower on SE McLoughlin directly west of the current tower on SE 52nd Ave. and SE Bybee Blvd. and equal distance between the current towers near SE 13th and SE Bybee Blvd and at SE 17th Ave. and SE Milwaukie Ave would provide nearly the same coverage pattern and would not pollute our residential neighborhood, visually, audibly or otherwise. I am disturbed by Clearwire’s current advertising campaign on OPB, “Covering Portland”. I am not a Clearwire consumer and I am not asking you to offer more coverage in my neighborhood. I do not feel secure under Clearwire’s blanket of coverage and I am asking you to refrain from citing any towers in the Woodstock or Eastmoreland residential neighborhoods. Thank you in advance for your time in selecting more suitable locations for your new towers. This entry was posted in Cell Phones, Environmental Health, Precautionary Principle, Read, Watch. Bookmark the permalink. This entry was posted in Cell Phones, Environmental Health, Precautionary Principle, Read, Uncategorized, Watch. Bookmark the permalink.